Inspired By True Events - This is one of the many reasons the Theater Bats should not be around children. This is one of the many reasons the Theater Bats should not be around children. 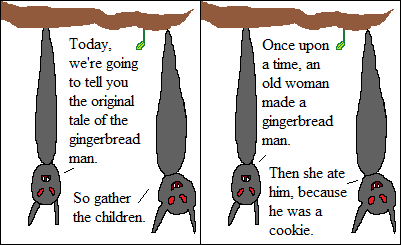 The Gingerbread Man was always a ridiculous fairy tale, even as fairy tales go. There’s not really a moral, except I guess if you’re clever enough you never have to outrun anything. Plus, there’s the fact that the thing just jumps up out of the pan for no real reason. It’s just ridiculous. I only made a comic this short because I slept in, but now I’m thinking that maybe this could make a good recurring recurring strip: Comedy and Tragedy tell fairy tales. I may just do more if the mood takes me.